The point is not to compare the various container types (as in Map Performance or Accessing Objects), but the huge speedup when the cast is added. For Array and Vector, the cast nearly doubles the speed! For Object, Dictionary, and dynamic classes, the optimization is less drastic, but still about a 25% speedup. These three lines are the only difference between the “cast” and “no cast” versions of every tested type. How can adding instructions yield a 2x performance increase? I do not know. I’ve looked over the source code and bytecode at least a dozen times now and am positive that I haven’t switched the order or anything silly like that. If you spot an error, please comment below about it. Barring any mistake though, it looks like we have a way to hugely increase the speed at which we can access Array, Vector, Dictionary, Object, and dynamic classes! what about item = MyItem (items[index]); ? I always thought “as” brings additional overhead of safety, converting non-MyItem-s to null-s, where MyItem (…) will throw an RTE. as is actually substantially faster than the function-style cast, if I recall earlier tests correctly. You do recall correctly. I converted the test to use function call-style casting (as suggested by makc) and the overhead made the cast version a little slower than the no-cast version. people are checking this on wonderfl, and overall seem to have an agreement with your results, but not me :) http://wonderfl.net/c/q0Fr <- here I have both "as" and f-style cast slower than untyped access (but "as" is still faster than f-style cast as you said). Those tests still stand up for me. The speed up is definitely coming from the JIT here, possibly knowing the size of what’s being extracted allows for lookups to be directly inlined when generating machine code instead of passing through the native index function. What I’m curious about now, is whether or not saving MyItem to a variable will result in more of a speed gain, or remove it; as well as if an index into the multiname pool is faster (the class would need to be public and in its own package). The latter may offer no change, or it may speed it up. The former could do anything. One also has to wonder if a normal dot lookup to a non-dynamic property is sped up from this, or slowed down. While probably slowed down, apparently we can never know for certain without testing. Changing the type of item to Object fixed the warning, but the speed was much slower. It was more on-par with the no-cast version. As for regular, non-dynamic dot access, I did try it but there was no speedup so I didn’t post the results. While both are of limited use, generic code, such as what’s in a library, could benefit or suffer from any differences between this and an equivalent constant lookup. So this advantage is definitely centered on load-time known types, and not on run-time determined types. A bit of a shame, this could have pushed my sort method to match or beat sortOn on all systems; not just the older systems where the main advantage is the in-place sorting. I used to have casting in my old 3d engine but took time stripping it all out as a number of tests showed it was definitely slower! This must be a newly added optimisation… do you have a way to test is across different flash versions! Also have you tried it with inbuilt classes i.e. Vector3D or something like that? And yes, it does work for Vector3D. However, the speedup seems to be much reduced on top-level classes like String. Wow, that’s a massive speed increase. I can kind of understand why this would be beneficial for an Array, as all of the elements are untyped, but I don’t understand the speed improvements for a Vector. Although, thinking about it, you don’t necessarily have to reference an element in a Vector to a variable of the same type (interfaces, subclasses, etc). So I guess there could be speed increases there too. Regardless, it’s an awesome spot! You will be surprised but not on the right way. The code snippet in the link looks just like a regular loop over a Vector. Am I missing something? Well in your test you didn’t use the Class after the as , what i added is a simple usage of the class for example read of a property or calling a method, and the result are terrible. Ah, I see now. I too see very poor results with the as cast when accessing a property or calling a method of item. However, there are other cases where I can insert some extra code into the loop and still see better performance with the as cast: Math.sqrt(64), item = item, item2 = item, or item = null. As skyboy correctly points out, these results are due to something going on in the JIT. I’ve looked at the bytecode for the property access and method call versions and nothing stands out. Anyone have any more ways that the item can be used once it’s been quickly accessed using the as cast? Tested with top-level class (like String, Number, Object) typed variables in the array. Interesting find. I’ve just tried String and int and there was either a minor (~5%) speedup or no speedup at all. Built-in classes that are not on the top-level (e.g. Vector3D) do get the speedup though. Interesting. I am seeing the speedup on Windows with Flash 11 plugin, Flash 10.2 standalone, and Flash 10.1 standalone but not in Flash 10.0 standalone. All of this is with a 2.8 Ghz quad core Xeon W3530 on Windows 7. What system and OS did you run the tests on? Hello, I run the test with a 2,67 GHz Core i5 on Win 7 64 bit. I tried the test in 10.3 and 11.0 inside browser as well as 10 standalone and the results seem pretty consistent. I’ve also tried using int instead of MyItem, and there is little difference. I did however notice in the standalone DEBUG version my results were more in line with janas’ results. the project was compiled for release, not debug, but was ran inside the debug player. I’m not sure what you’re reporting here. Which versions are you seeing the cast speedup with and which are you not? Also, I try to never test under debug as end users do not run it. I see the speedup everywhere I tested except for standalone-debug. The reason I’m posting this is to give some perspective to others that are seeing these reverse results so that they test results in non-debug version of flash player. Great article. What are you using to view the compiled byte code? Are you doing it by hand or is there a tool you use? Hmm, it works on basic asset swfs published from Flash, but our main project swf has the following error. It also seems to happen whenever I compile any swfs using Flash Builder 4.5. What are you using to compile your swfs and what sdk version are you using (if that matters)? Nemo440 only works for certain target versions. Up to 10.1 I think. In this case it seems that cast is less efficient. While thinking about this, I realized the JIT might actually be removing operations, treating them as dead code. Jonas’s tests seem to verify this. A few simple and very quick operations seem to negate the DCE because it’s not complex enough. That code should be able to avoid any DCE, but the operations are all very fast and O(1) so do not impact the results in any significant way. Replacing short circuited boolean operators (&&, ||) with bitwise operations and int/boolean conversions where applicable (e.g., where the operations are not more expensive than the jumps themselves) could be an article itself, since it provides significant performance improvements. I don’t think it’s DCE because that would result in an empty loop. Commenting out the loop body and running on the same machine as in the article (2.4 Ghz Intel Core i5, Mac OS X 10.6), I still get about ~25ms for the empty loop and the same 68ms for the as cast version. FYI, haXe (http://haxe.org) already does this optimization for you automatically. It also does fast array-index lookup, for instance in AS3 you have to convert arr[x+1] into arr[int(x+1)] in order to get decent speed. I don’t see any astypelate instruction in there, which seems to indicate that haXe isn’t doing this exact optimization. I do see a double coerce though, so perhaps that’s meant to do the same thing. As for performance, on my 2.8 Ghz Xeon I’m getting about 94ms for the “no-cast” version, 55 ms for the “as cast” version, and 94ms for the haXe version. This would also seem to indicate that the optimization hasn’t been done, since the haXe version is performing on-par with the unoptimized “no-cast” version. It seems like you’re using the debug version of Flash 11 and the release version of Flash 10. This is interesting find, it’s curious how it is slower in debug version… but not release. Mmm – 10 x slower on my machine ( MBP 5.2, 2.66 Intel Core Duo, 4GB memory ) after copy pasting your code. I try to never test with the debug player. Not only are the results much slower than with the release player, but sometimes code that is faster in release will be slower in debug. Jackson, this is very interesting and it´s going to help me a lot in some process consumer functions. One thing I notice, is that if I do the test with FP 10.1 debugger it get like double time casting but with FP 10.1 not debugger it get same result like yours. Another thing I don’t understand is way Vector casting is faster, if Vector is already casted. The debugger player is notoriously slow and inconsistent with the performance of the release player. For example, A may run faster than B in the debugger and then slower than B in the release player, even if both run much faster. Usually this is because the debugger punishes AS3 code heavily and native code (i.e. most of the Flash API) much less or not at all. For these reasons and that virtually no end users will ever run the debugger player, I’d recommend only performance testing with release players. This is the policy I’ve always had in this site’s articles. 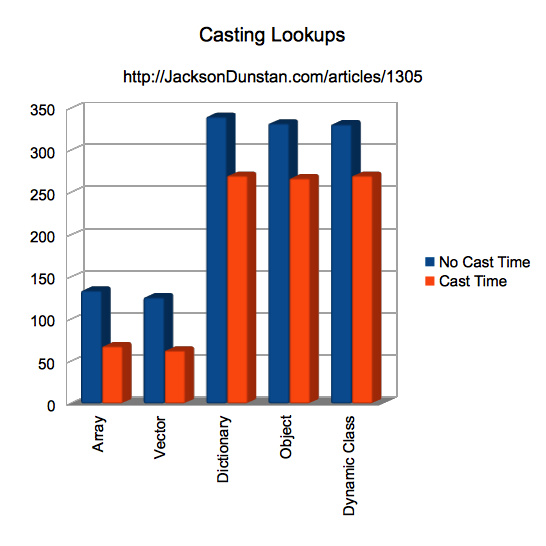 As to why Vector casting is faster, that is why the article has the word “amazing” in its title. You’re correct- It shouldn’t be faster at all as the Vector is already typed. Actually, that’s the whole purpose of a Vector. The reason for the speedup remains a mystery to me. I was happy when I found this article as I thought I could get some code running faster. Since I’m using a different environment, I first ran your test code to make sure it worked the same and got similar results, aside from vector which seemed the same. This made sense since Vectors are type cast anyways and the newer libraries are supposed to be optimized. Which is almost 4 times as slow. This blew my mind, so I decided to run the same benchmark you had, but using Number instead of a user defined class. I’m wondering if I made a mistake in the code, or if it’s the new libraries. It seems the casting is still faster for user defined classes but much slower for primitive data types. I’m not currently using the ASC 2.0 compiler though, but I know it does a very good job at optimizing. I’m curious if, with the newer libraries and possibly ASC 2.0, you still get primitive data types to be faster and if so why I don’t see the same results. Again I concur with your findings. This seems to be a huge change that has occurred since the article was originally written. I have a hard time believing that it’s due to my upgraded hardware, probably doesn’t have anything to do with upgrading my OS, and ASC 2.0 isn’t making much of a difference beyond the normal “noise” in testing. So it seems that somewhere between Flash Player 10.3 and 11.6 there was a change that dramatically reduced the performance of casting the result of a lookup to a top-level class. That’s a shame and possibly even a bug. Vector is now also worse off with the cast, but at least the optimization is still present with Array. The dismal performance of Vector in the first test is probably because of the target version of flash in the SWF (and may impact casting for Number/int: different target versions occasionally use different code paths for compatibility’s sake). The effect of Number/int performing worse with the cast may be due to changes in the VM, causing a conversion to a boxed type then back? The same penalty may not exist for generic top-level classes; if it does, then the penalty is stemming from the way the core classes are included with the VM (rather than boxing/unboxing), effectively containing them in a separate SWF and limiting how much can be optimized due to the different context. i’m no expert, but just thinking about how type casting might be done behind the scenes might explain why it’s faster to type cast items in a loop. if the type is not known, then perhaps Flash Player must iterate the unknown object, looking for properties and methods, and then attempting to match them to the defined type. But perhaps using “as” instead iterates the targeted type, matching it to the item’s vars/methods. a test might be to have MyItem be a complex class, but the item[i] is of a type extended from MyItem and has extra params in it. or perhaps MyItem is an interface or something. Maybe some tests like that will give a clue as to how type casting is done behind the scenes. If Flash Player does use different forms of type casting, then it would follow that the more base types like String and Number and the optimized Vector class would not benefit from type casting because the type is already known, and the extra step would slow it down.